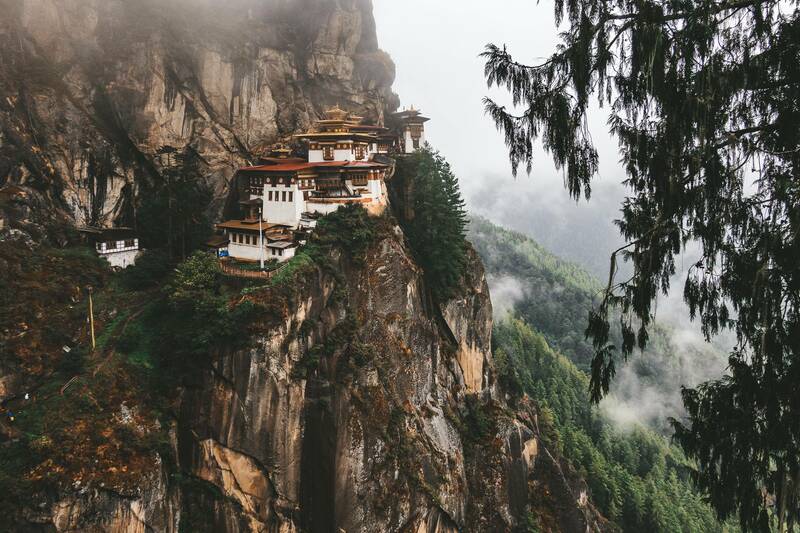 When I first saw a photo of the Tiger's Nest Monastery in the Royal Kingdom of Bhutan, I knew it was something I couldn't miss and had to move to the top of my bucket list. Before leaving, know that there are some restrictions to enter Bhutan. Except for Indians, Bangladeshis, and Maldivians, all other nationalities need a visa before entering. It costs $40 USD and, no, it cannot be done on arrival; it will be arranged by your tour company. 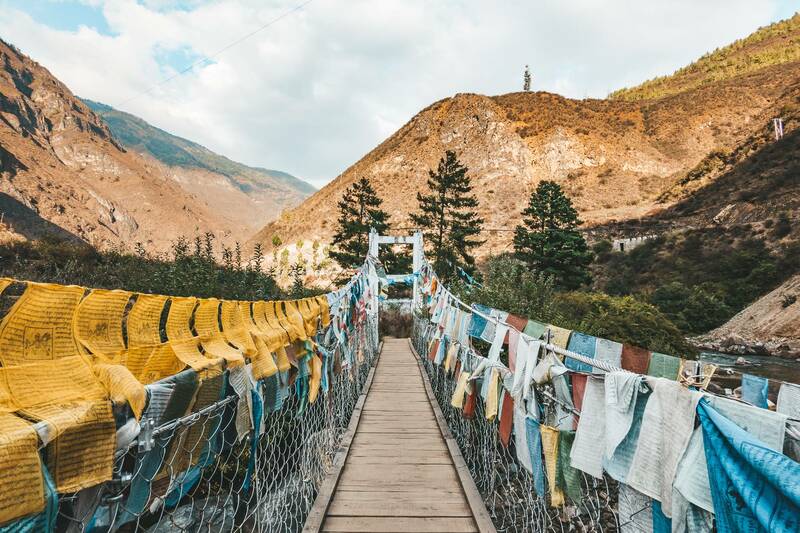 Speaking of tour companies, you have to visit Bhutan with a tour (this can be a smaller private tour with 3 people minimum – which is what we chose – or a larger group tour). And I'm not saying you have to because I love tours, I'm saying this because it is mandatory and (unless you're from Indian, Bangladesh or the Maldives) it is impossible to travel the country independently. 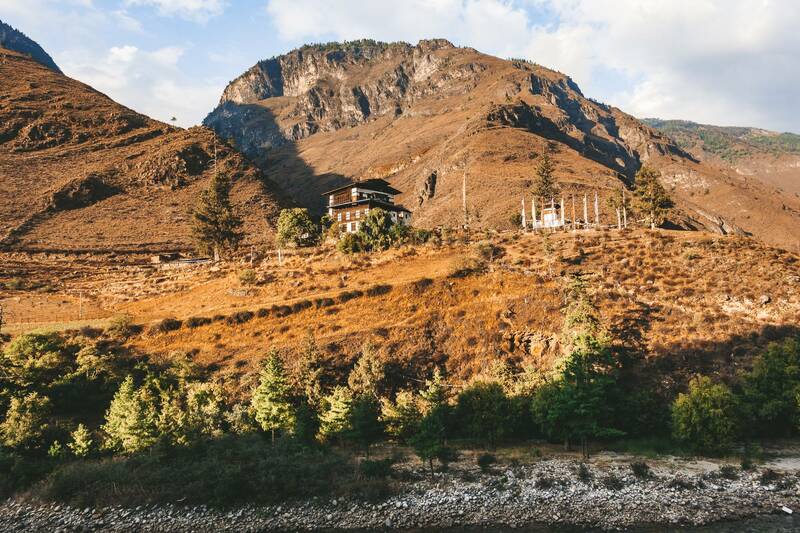 We chose to experience Bhutan alongside Bhutan Mountain Holiday and were blown away by their kindness and service. I couldn't recommend them enough! This tourism tax is in place to promote “high value, low volume” tourism; it's a way to preserve their culture and beauty of the Kingdom. Given this, we flew from New Delhi, India to Paro, Bhutan on the very efficient (albeit expensive) state-owned airline Drukair. New Delhi to Paro via Drukair. This “everyday” flight was more like a scenic flight! The flight path took us as close to the Himalayan Mountains as one could get (without actually climbing them)! 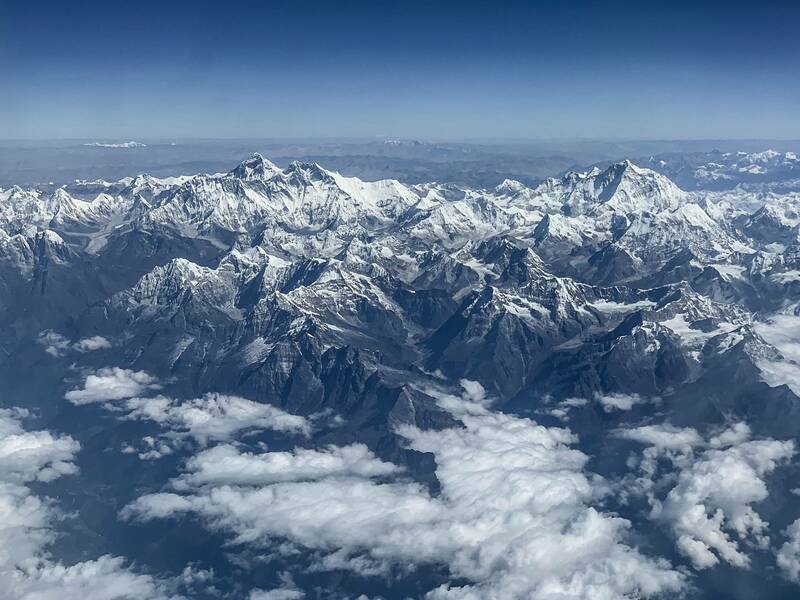 While the clouds obscured the view of all but the peaks of the highest mountains on the way from Delhi, the view on the return flight was perfectly clear and spectacular! Not only did we have a fantastic view of Mt. Everest, but also the entire mountain range was on full and glorious display! 5 FT Fun Fact: For the best views try to get window seats on the left from Delhi (seat A, as close to the rear as possible so your view isn't obstructed by the wing) and on the right on your return (seat F). Now you have to realize that Paro is on the list of the ten most dangerous airports in the world because the airport is surrounded by mountains and the runway is only 1.9km long (half the length of New York's JFK); in fact only 8 pilots in the world are licensed to fly into Paro! Our pilot guided us safely into what has to be the most beautiful airport I have ever seen in my extensive travels. We were through Immigration quickly and then warmly greeted by our guide Tula and driver from Bhutan Mountain Holiday. 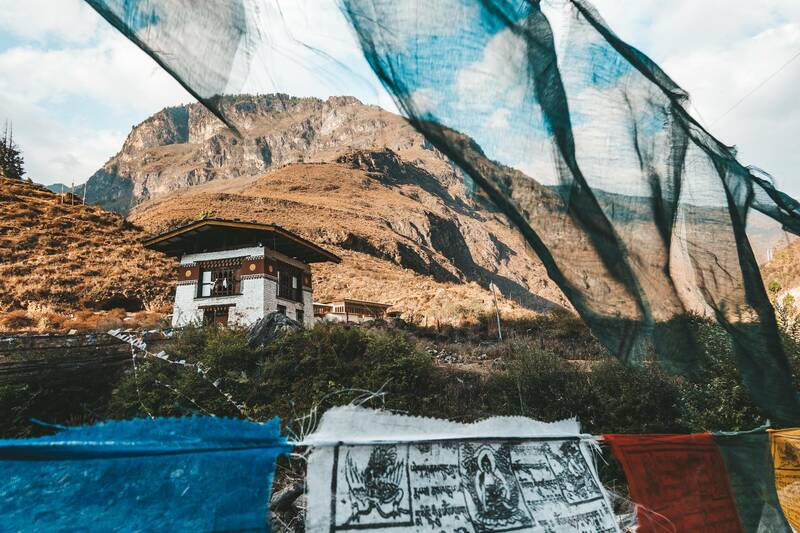 First Impressions of The Kingdom of Bhutan. The immediate first impression was that the countryside is breathtaking. There were few stretches of flat road as we were constantly ascending and descending hills and mountains. Our first stop was the 13th century Iron Chain Bridge, which looks like it would be pretty dicey to try to walk across; fortunately, you do not have to worry about that as it is closed. Crossing the not terribly stable adjacent pedestrian suspension bridge gave us our first close-up look at Buddhist prayer flags in Bhutan. A short walk took us to a Buddhist shrine, dedicated to the Iron Chain Builder. It was our first glimpse of the beautiful and colorful intricate designs we were to see again and again (and never tire of). Just uphill from there was the small, lovely, and private Tachog Lhakhang Dzong monastery. A scenic drive to the capital city of Thimphu took us to the Peaceful Resort (homey but not really a resort) for a delicious dinner of local cuisine before bedtime. Excited for Day 2! 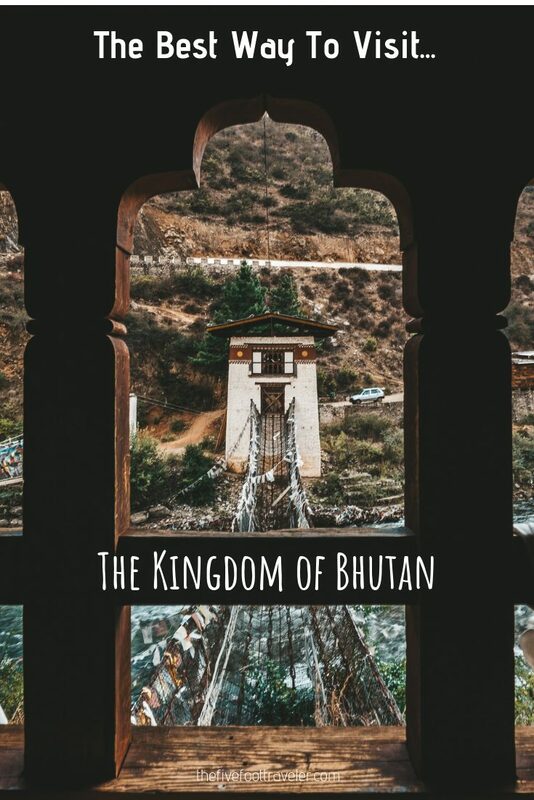 Interested in Visiting the Kingdom of Bhutan? Want To Travel More? Let's Adventure! Enter your email below to receive my latest travel stories and tips! 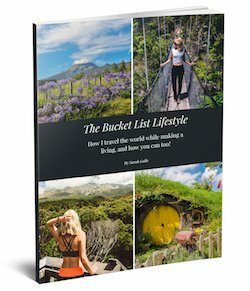 You'll even receive a FREE E-Book on how you, too, can travel the world full-time and still make a living. I solemnly swear to only send you emails related to traveling, being a digital nomad, and monetizing your blog and social media following.